A few weeks ago, we found out that ALL British Gov documents go to Hamburg for 'recycling'. In a 'Green' effort, the British Government send all documents to a 'recycling' centre, where the items are pulped and recycled, and then sent back as fresh paper - a system called "closed loop recycling". As it is 'closed loop' recycling, the British Gov get the same amount of papers back as they send, so "every month, 42,000 boxes containing more than 100 million sheets of A4 paper"
For security, the sensitive documents are shredded; "civil servants man workers as they shred the paper in the car parks outside government buildings." Then a firm takes the documents and shredded files on a trip to Hamburg Germany. It should be noted that several senior people have made the argument when questioned regarding this clear path for espionage, defending that the highly sensitive documents are shredded, and therefore of little use to prying eyes. We figured they were using Siemens' Optical Character Recognition attached to a mail centre divider and facing machine for the unshredded documents, processing upwards of 30,000 docs an hour (per machine). 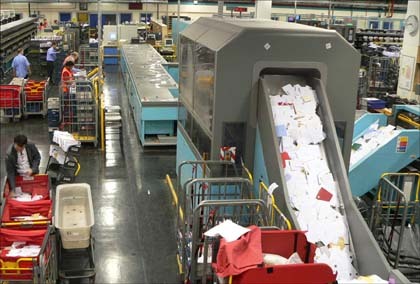 By processing, we mean the mail centre style machines (similar to Royal Mail's IMP machines) can sort the documents whilst taking a photographic image of the document. The photographic image is attached to Siemens OCR technology which can read handwriting, converting the image files into a keyword searchable document. But how were they putting huge amounts of shredded docs back together? "in May 2007, the German government revealed the world's most sophisticated pattern-recognition machine, the $8.5 million dollar E-Puzzler, which can digitally put back together even the most finely shredded papers. "The task to automatically reconstruct 16,250 bags full of torn documents using a technical system... presents an enormous technological challenge," says Bertram Nickolay, the lead inventor of the machine. Prior to the creation of the E-puzzler, a team of 15 Germans had laboriously been putting the pieces together by hand. But they managed to rebuild only 10,000 documents from 300 bags during 12 years. The German government estimated it would take a further 600 to 800 years to finish the job. With the E-puzzler, Nickolay says the government will be able to un-shred the remaining documents by 2013" (But that is with just one machine). The Germans have potentially got an industrial scale, factory-style, conveyer belt espionage system copying all British documents. Every month we send them over to be 'recycled' (copied) and they then pulp them and send the items back. They have the MEANS, the MOTIVE, and the OPPORTUNITY. This is being done in the name of saving a few quid on recycled paper to appease the Green movement! A HUGE security risk. Just wanted to say thanks for all the great info on Germany's role in these times and the things which are about to happen. Even though you don't receive comments I encourage you to keep up the good work. It's valuable and insightful and you are on target with your analysis and predictions of what Germany is trying to accomplish and how they will act very soon. Thanks again.